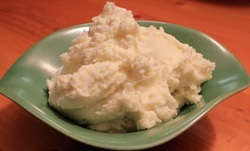 Creamy, light mashed potatoes with a just hint of garlic and Parmesan cheese makes this recipe special. Serve these mashed potatoes any night of the week. In a large saucepan bring enough water to boil to cover the potatoes and garlic. Add the diced potatoes and whole garlic to the boiling water. Cook, uncovered for 7-10 minutes, until the potatoes and garlic are tender. Drain both the garlic and potatoes, return the potatoes to the empty pot. Mash the potatoes and garlic with a potato masher. Add the milk and yogurt, mixing well using an electric mixer. Fold the Parmesan cheese into the mashed potatoes. Spoon mashed potatoes into a serving bowl. Serve warm.